The Guild of Aviation Artists is recognised throughout the world as the premier society for the promotion of aviation art. With some 400 members, the Guild brings together the worlds of art and aviation and stages exhibitions and events across the UK. 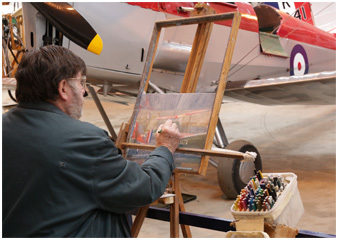 The Guild’s principle aim is to promote aviation art in all its forms and to encourage interest in the genre by artists and non-artists alike. To find out more about the Guild, click here. 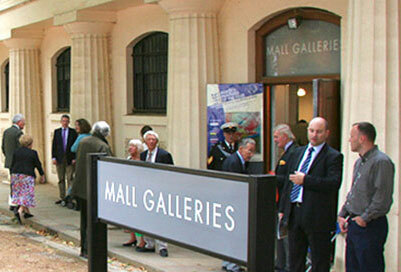 Every Summer, the Guild stages ‘Aviation Paintings of the Year’, a major exhibition at the prestigious Mall Galleries in Central London where over 400 works go on show. It is the largest exhibition of its kind in the world and admission is free. The 2019 exhibition will run from 22nd - 28th July. Click here for details. All the works from the ‘Aviation Paintings of the year’ exhibitions are available to view via our online galleries where you can search for particular aircraft or artists. Click here to view. Why not join us? Whether you’re an artist thinking about aviation as a potential subject or just interested in aviation art, come along to one of our informal and friendly regional meetings and have a chat with some of our members. To find out what the Guild is doing in your area, email us or call 03331 302223. Alternatively, click here to find out more. To view the Guild Rule Book including its Byelaws, please click here.